Unmanned aircraft systems (UAS) – also known as model aircraft or drones – are a new way to obtain unique views of wildlife and natural landscapes. Besides this, they also offer a new method for scientific researchers and emergency responders to obtain important information about marine mammals that can further support the conservation of these protected species. NOAA Fisheries supports these uses and plans to develop additional guidance for scientists using UAS in their research projects in order to help reduce their impacts on the animals. Despite these benefits, UAS can also be disruptive to both people and animals if not used safely, appropriately, or responsibly. Scientists and wildlife managers are concerned that acute or chronic disturbances of wildlife can significantly impact the animals’ health and fitness by disrupting migratory patterns, breeding, feeding, and sheltering. As a result, NOAA Fisheries continues to evaluate both scientific research permit applications to ensure that the potential hazards do not outweigh the benefits, and other types of public activity that have the potential to negatively impact protected marine species. For recreational use of UAS, NOAA Fisheries reminds the public that dolphins, whales, seals, and sea lions, are protected species and harming or disturbing them can be a violation of Federal law. The Marine Mammal Protection Act of 1972 (MMPA) makes it illegal to harass marine mammals by changing their behavior, which may occur if they are approached too closely. Federal guidelines recommend keeping a safe aerial distance of at least 1000 feet (300 yards) from marine mammals in the wild. 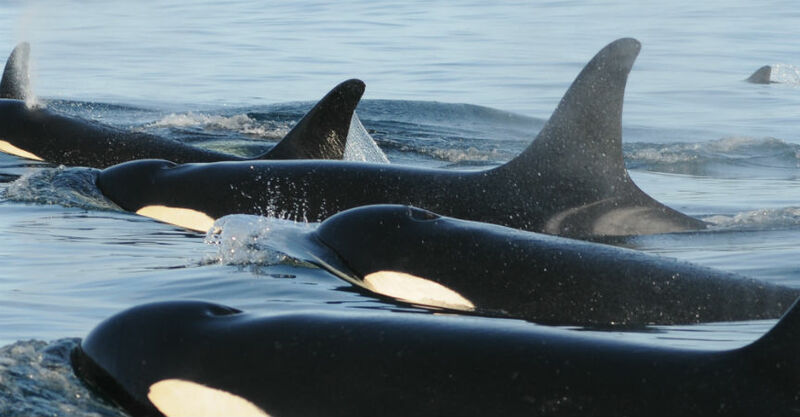 The Endangered Species Act of 1973 (ESA) also provides additional protections for those species of marine mammals listed as threatened or endangered. For example, Federal regulations restrict close approaches by air for humpback whales in Hawaii (1000 feet = 300 yards) and for North Atlantic right whales (1500 feet = 500 yards). When using your UAS in the marine environment, NOAA Fisheries recommends using common sense and following existing Federal marine mammal viewing guidelines to ensure a positive viewing experience for the public, whether on the water, on land, or in the air. These guidelines provide helpful tips for members of the public who want to observe whales, dolphins, seals or sea lions. As we continue to assess the impacts of UAS on marine mammals (and wildlife in general), a good rule of thumb is to take a precautionary approach and avoid flying UAS in the vicinity of the animals. In addition, it is important to remember that the Federal Aviation Administration (FAA) also provides hobbyists with some basic guidance for operating UAS to address safety and privacy concerns. For example, do not fly UAS above 400 feet, keep the UAS within sight, and avoid flying them near airports or over people. The U.S. National Park System has also recently prohibited the use of UAS in our National Parks (some of which provide habitat to marine mammals). We all have a responsibility to help keep whales, dolphins, seals, and sea lions safe. Remember to use UAS safely and appropriately, and avoid flying it close to protected species. Below are some helpful online resources if you are interested in learning more.